Nutrition Corner: Eat More Butter! Grass-fed, organic butter is one of few foods that contain high amounts of butyric acid, shown to decrease inflammation in the body. Grass-fed butter is also a rich source of Vitamin A, which is responsible for its yellow coloring. Grass-fed butter also contains medium-chain triglycerides, which serve as immediate fuel for our body. Always choose grass-fed butter over processed margarines and vegetable oil based butter substitutes. In a medium sauce pan, over medium heat, add water, milk, salt, nutmeg, and butter. Once liquid is warm and ghee is melted, reduce the heat to low and add polenta, whisking slowly and consistently. Cook until it thickens (12-15 minutes). Test by tasting to make sure that the polenta has rehydrated. Pour polenta into a small baking pan, dish, or small sauté pan (about 6’’ x 6’’). You would like the polenta to be about an inch thick. Let cool for 2-3 hours and cut into 2-4 cakes. Prepare the mushrooms: In a large sauté pan, over medium-high heat, sauté the mushrooms in coconut oil until tender and starting to juice. Add scallions, garlic, salt and pepper and sauté 1 minute. Add white wine (or broth) and reduce 2 minutes. Add coconut milk and reduce to thicken (2-3 minutes). Transfer to a bowl, cover and set aside. Prepare a steamer and once steaming, add spinach until just wilted, 30 seconds. Transfer to a bowl, season with a dash of salt and pepper to taste, cover, and set aside. Return sauté pan to medium heat and add 1 teaspoon more oil if needed until very hot. Carefully add tomatoes and toss until just blistered (blackened) but not cooked through. Transfer to a bowl, cover, and set aside. Lastly, place the polenta cakes in the greased skillet and sauté over medium high heat to get a brown crust. 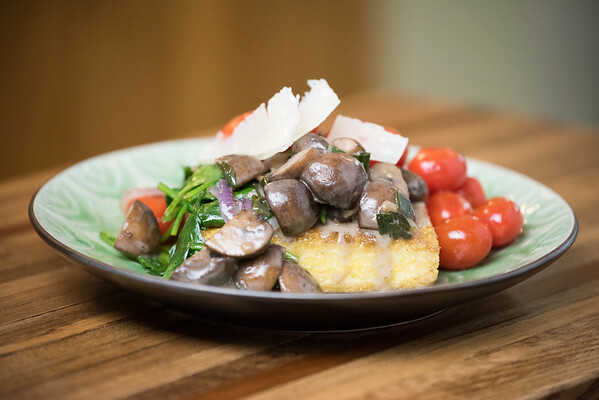 Plate 1-2 cakes on each of 2 serving dishes and top with mushroom ragú, spinach, and tomatoes.